Since the last time we took a look into the world of often needlessly complicated crazy coffee contraptions, things have gotten even crazier. Making a perfect cup of coffee is relatively easy and inexpensive task. Despite this, enterprising people seem to find ways to make this simple process more costly, more time consuming, and loaded with excessive steps. 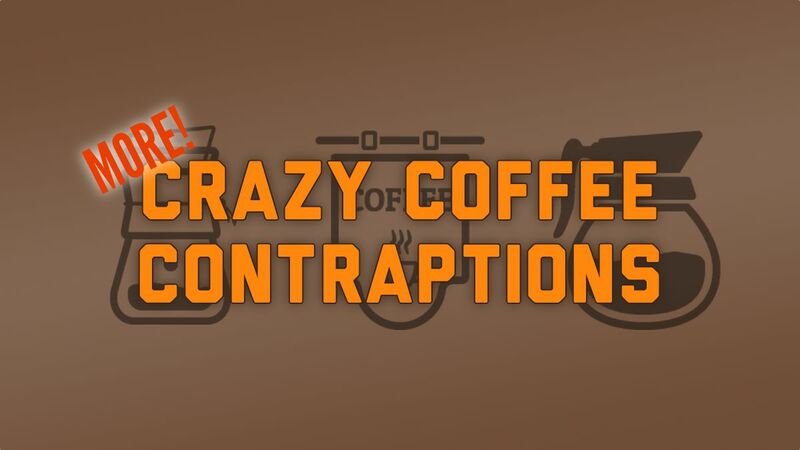 Here then, are seven more crazy coffee contraptions for your consideration. The Kinto Slow Coffee Brewer is a minimalist pourover coffee contraption consisting of a dark walnut base supporting a polished brass stand. The stand holds a glass brewing cone (to allow for observation of the dripping process) which in turn holds a stainless steel filter. The accompanying glass server features tiny dots on the side for precise monitoring of the coffee brewing progress. It’s accompanied by a small glass container for measuring beans that pulls double duty as a resting place for the brewer and the stainless steel filter. Price: $188. The Moccamaster brews a whopping 10 cups of coffee like any $20 coffeemaker from Target. But this upscale version can brew those 10 cups in just six minutes with water that’s heated to the optimal temperature range of 196 to 205 degrees. It’s said to feature a pre-immersion drip system that moistens the grounds in such a way that allows the coffee to bloom. Another key element in this coffee contraption is the hot plate which keeps the liquid in the carafe at a gentle 175-185 degrees Fahrenheit for up to 100 minutes. Price: $330. With the Brux Boco Pourover System, coffee lovers who also enjoy hiking are no longer forced to make concessions to coffee quality when out on an adventure. With this contraption, one is able to brew and drink coffee using just one device. This stainless steel, vacuum-insulated bottle (in conjunction with its gasket-sealed plastic lid) will keep coffee hot for hours. That is, if one needs hours to drink just 20 ounces of coffee. Price: $70. The Elektra Micro Casa Leva S1 is a classic handle-operated espresso machine direct from Italy. Elektra has been making espresso machines since 1947, and their iconic eagle stands vigil in countless coffee bars throughout the world. The Casa is their home edition, available in three different versions: chrome, copper-brass, and chrome and brass. Priced at $1,550, this one’s for serious espresso aficionados only. But check out that superb pressure gauge! The Canadiano is a simple wooden coffee brewer that makes just 250 ml (about nine ounces) of coffee per brewing. Carved from a single block of charred and smoked Canadian White Ash, this coffee contraption offers what the company promises to be a unique gastronomical experience. To keep the grounds out of your cup, the brewing coffee flows through a surgical-grade stainless steel filter after filtering through the wood. If you fancy your coffee brewed with the natural flavors of wood, is the contraption for you. Price: $125. The Perk Brewer was initially designed for astronauts to brew coffee in low-gravity environments (like, you know, space). This coffee contraption, which can allegedly be completely 3D printed, claims to fully automate the entire pourover process. 495 people ignored the idea that making a pourover coffee doesn’t really need automation and funded the Perk through Kickstarter. However, the device missed its original ship date of March 2018, and now the inventors seem to have stopped responding to backer queries. Considering the website has gone dark, we may never be able to experience the bliss of zero-G pourover automation. Price: $300. The Anza Concrete Espresso Machine is, as the name suggests, an espresso machine made from concrete. This coffee contraption, the result of another Kickstarter project, was also initially scheduled to show up in March 2018. The the ship date has been updated to August 2018, but unlike the Perk above, the inventors of the Anza continue to update their backers. So you may yet be able to own the densest espresso machine ever made. Interested buyers who missed out on the Kickstarter campaign can snap one of these up for the discounted price $799 (down from $1,299) through IndieGogo. But, as IndieGogo is known for not vetting scammy projects, proceed with caution. I’ve been drinking coffee since I was five years old, so I know a thing or two about how to make the perfect cup of coffee. This is the right way to do it.